Born in Buenos Aires, Argentina, Lidia Kenig-Scher started drawing and painting at a very early age.. When a school teacher asked why she was compelled to draw and color a picture every time she wrote a sentence or worked a math problem, Lidia responded that the school work came from the teacher, but the pictures come from her heart and helped her learn best. This early philosophy has not changed. Whatever role Lidia plays or has performed, creating beauty aimed at making learning better or helping people grow spiritually and better understand life, has been part of her life’s quest. Lidia earned a bachelor of fine arts degree in sculpture and architectural design in her native country, and holds a Master of Science in Art degree from the Massachusetts College of Art. Her strong skill set is grounded in 39 years of Buddhist meditation practice and studying with such teachers as HH Lin Yun, Rinpoche; Tich Nhat Hahn; Stephen Devine, Helen and James Jay, John Kehoe, Ihaleakala Hew Len and Anthony Robbins. Today, the award-winning, painter, sculptor, interior designer and Feng Shui master creates powerful artworks that vibrationally alter the space. Many clients and collectors have observed that the art installed in their homes and offices not only lends beauty and harmony, but have been catalysts for beneficial change and growth. And after 30 years as owner and principal designer of LAS Associates, an interior and architectural design practice specializing in dental and residential design, Lidia has officially retired. Her time and resources are focused on creating art and teaching. However, she is available for Feng Shui consultations that include space planning for purchasing homes or businesses, remodeling and new constructions. Lidia is officially represented by Xanadu Gallery, Scottsdale, AZ. Through my work, I aim to reflect peace, harmony, love, compassion, happiness, truth, authenticity and acceptance. My intention is to express and teach what I’ve learned about living meaningfully and how to be the change I seek in everyday life. 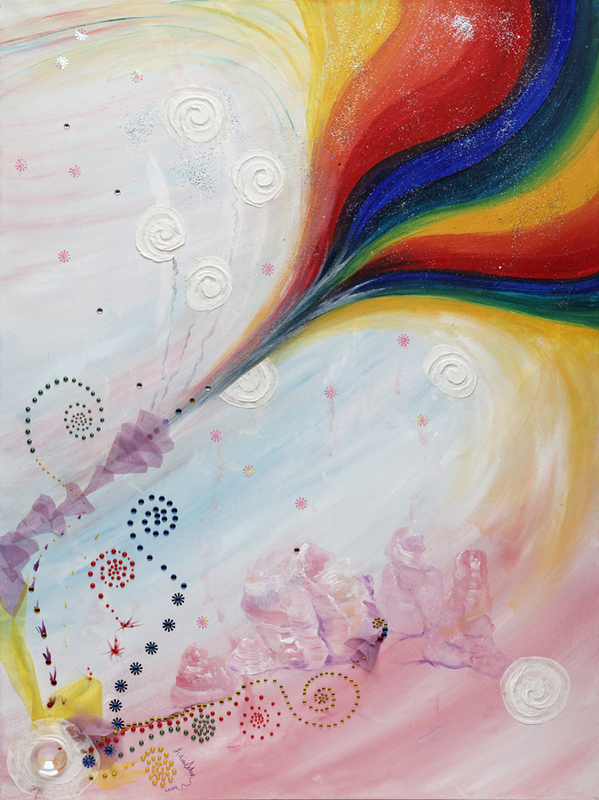 I paint about what happens in my inner world and how it reflects on the outer world. Art is my vehicle for healing. A painting begins after deep meditation. 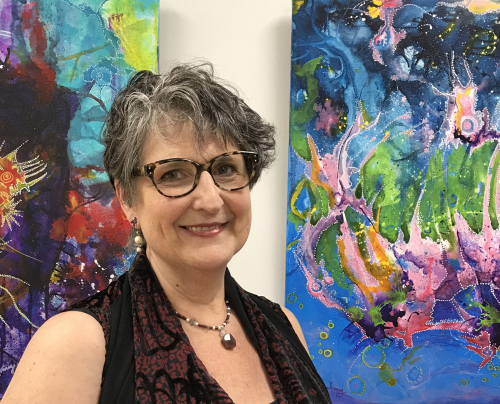 In the studio, I physically engage with the materials and processes; acrylic paint offers versatility, vibrancy and can easily blend with other media so I may play thoughtlessly and joyously with textures and colors. I get lost in the process, giving all of myself – mind, body and spirit – and when the canvas is complete, I trust that the image created is one that was meant to be admired and shared. I believe that everything in the universe is made up of energy vibrating at different frequencies. Artworks have a vibrational field comprised of its elements and principles, the physical aspects of how it was created, and the artists physical, mental, emotional and spiritual state while creating the piece. Art energies affect the artist and the space where it’s installed, mingling with the energy of those who in one way or another interact with it and create new and ever-changing conversations. These conversations start with the artist’s intention. When you look at art you may not know what the intention was, except for subtle hints sometimes given by its title, yet you will be touched by the art’s vibration. This happens because the subject of the creator’s work will set off a spark – causing you to connect or inquire deeper about a matter in your life that’s somehow related. It is that undeniable, intangible emotional connection that makes art one of life’s most beautiful celebrations. If you are attracted to a particular piece of art, answers await. If something pulls you in, beckoning you to enter its world, play and ponder…don’t hesitate! There is intention behind every kind of art, and there’s an adventure just waiting to be had, if you take the time to behold the images, open your heart and listen.